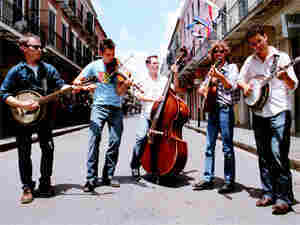 Old Crow Medicine Show: Return To Roots : World Cafe Old Crow Medicine Show brings its rootsy back-porch sound to World Café, where it showcases songs from the new Tennessee Pusher. The disc takes a modern approach to Americana with gospel and rock overtones, but leaves the band's roots firmly intact. Legendary bluegrass and country guitarist Doc Watson discovered Old Crow Medicine Show busking on a North Carolina street corner, and the band has been an upward trajectory ever since. From appearances at Watson's Merlefest to opening for Dolly Parton and making regular appearances on A Prairie Home Companion, the group has gained a reputation as one of the rowdiest acoustic acts in the country. Now several albums into its career, Old Crow Medicine Show brings its rootsy back-porch sound to World Café, where it showcases songs from the new Tennessee Pusher. The disc takes a modern approach to Americana with gospel and rock overtones, but leaves the band's roots firmly intact. This segment originally ran Nov. 4, 2008.